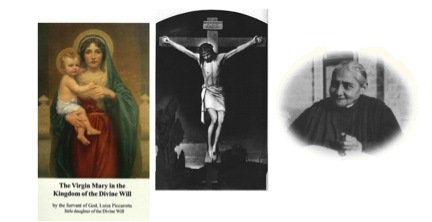 Oh my Crucified Jesus, Mother Mary with Luisa in the Holy Divine Will, I beg of You and to receive the prayer I now offer Thee for my last moment, when, having desired a holy death, all my senses have failed me. At my last moments when therefore my sweetest Jesus, my eyes, languid and sunken, can no longer look upon Thee, remember this loving look which I now turn to Thee in Your Will with Our Blessed Mother Mary through little Luisa, and have mercy on me a poor sinner! When my lips, dried up, can no longer kiss Thy Most Sacred Wounds, remember these kisses which I now give Thee and Our Blessed Mother Mary with Luisa, and have mercy on me a poor sinner! When my cold and numbed hands can no longer clasp Thy Cross, remember the times that I held Your Crucifix in Your Will one with Our Blessed Mother and Luisa with love and devotion, and have mercy on me a poor sinner! And when my tongue, swollen and immovable, can no longer speak, remember my present prayers, and have mercy on me a poor sinner! Jesus, Mary, and Luisa I commend to you my soul in the Most Holy Divine Will. Lord Jesus crucified, have mercy on me, a poor sinner! Sacred Heart of Jesus, Immaculate Heart of Mary one with Luisa I place my trust in Thee. Amen.